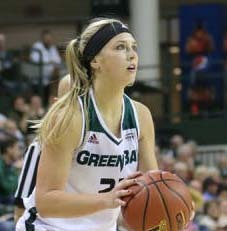 Jessica Lindstrom – Photo courtesy of Green Bay Athletics. The Green Bay Phoenix women closed exhibition play on Thursday night with a 76-34 win over Northern Michigan at the Kress Center. Superior native Jessica Lindstrom led the way with 14 points and 13 rebounds. Joining Lindstrom in double-digit scoring were red shirt freshmen Madison Wolf and Frankie Wurtz, who each added 10 points and went a combined 8-for-10 from the field. Green Bay’s defense never let the Wildcats get into a rhythm in the exhibition finale, as the Phoenix collected 22 steals and forced a total of 31 turnovers. The Phoenix now set their sights on the regular-season opener with Elon next Friday (Nov. 11) in the opening round of the preseason N.I.T.